Chick Chain is a 4-H activity that introduces youngsters, and often their parents, to the fun of growing baby chicks into laying hens. 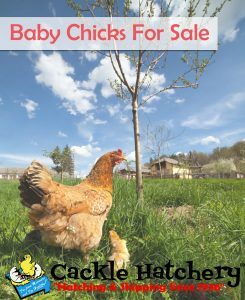 It’s called Chick Chain because participating youngsters receive baby chicks in the spring and sell some of their grown layers in the fall, with the proceeds funding the purchase of chicks for next year’s Chick Chain participants. According to “Clover All Over,” the 4-H Chick Chain program got its start in 1945 in Atlanta, Georgia, as a way to promote better laying hens. In those days it was called Pullet Chain, and the activity became so popular that within a few years it had spread throughout Georgia and into other southern states. In my state of Tennessee, 4-H clubs have engaged in Chick Chain projects since 1953, while in some of the other states participation has waned. Now, thanks to the ever increasing popularity of backyard chickens, along with aggressive promotion of the Chick Chain concept by Alabama’s Cooperative Extension System, interest is once again spreading among enthusiastic 4-H clubs. 4-H Chick Chain participants sign up for the project by February and receive day-old chicks in March. Before the chicks arrive, they attend an informational meeting where they learn how to care for their chicks. Parents and project leaders don’t need prior poultry experience. All they need is the same simple Chick Chain Production Manual provided to the kids. In September participants bring the prescribed number of their best hens to a 4-H Chick Chain Show and Sale. Each pen of hens is judged according to their healthy appearance and uniformity of size. After awards are distributed, the hens are auctioned to the public, often bringing in enough to fund not only next year’s Chick Chain, but other 4-H activities as well. One key to the success of a Chick Chain is the type chickens selected. Some clubs offer a choice, which might include crested Polish or Easter Eggers. In other programs, all participants raise the same kind of chickens, such as Cinnamon Queen. The success of the September sale hinges on whether or not the hens offered are of a type local buyers desire. In addition to learning about responsibility, record keeping, and poultry management, Chick Chain participants get to keep any hens they are not required to bring to the sale. When the program started, youngsters received 100 chicks and were required to return 25 pullets. Reflecting the times, participants now receive 10 to 25 chicks (depending on the particular program) and return 2 to 4. As a livestock project, 4-H Chick Chain is more accessible to urban and suburban kids than a program involving raising a lamb or calf. For many participants it’s their first experience with food producing animals. Many kids get such a kick out of supplying fresh eggs to their family, relatives, and neighbors that they continue raising chickens long after their 4-H commitment has been fulfilled. ← Do Your Chickens Need Deworming?